NEW YORK, December 11, 2012 — The Social Impact Exchange recently launched the Social Impact 100 (S&I 100) (www.SI100.org), the first-ever, broad index of U.S. nonprofits with proof of results and a high potential to reach even more people. Modeled on aspects of the S&P 500, the S&I 100 aggregates top-performing, evidence-based nonprofits so that funders – donors and foundations – can have confidence that they are contributing to organizations that consistently deliver impact. The S&I 100 tracks the number of people served across the portfolio of these top nonprofits the same way the S&P 500 tracks the profitability of America’s large-cap companies. Donors are able to give directly to nonprofits in the S&I 100. The S&I 100 is the most comprehensive donation platform of only evidence-based, growing nonprofits available to donors. Donors can choose from 100 high-impact nonprofits and nearly 16,000 local affiliates that are implementing their solutions. The Index features models that address the country’s most pressing issues across education, health, youth and poverty. The 100 nonprofits are rigorously screened for evidence of impact through third-party verified studies - made available to donors on the website – and are only included in the Index if they have the ability to serve more people in need. When donors visit the site, they are able to search for high performing nonprofits in the issue areas and locations that they care about most. Once they select a nonprofit, the S&I 100 allows donors to give directly to the organization in a few quick and easy steps. 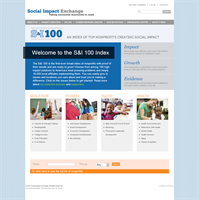 The number of organizations on the S&I 100 will grow as the Social Impact Exchange continues to reach out and identify additional nonprofits that meet the S&I 100’s criteria. According to a Money for Good survey, nine out of 10 donors say nonprofit performance is important. Until now, funders have not had an easy way of knowing if their dollars are doing the most good. Of the over 1.5 million nonprofit organizations in the country, there is a dearth of rigorous information donors can trust to tell them which are the highest performers and are growing their impact. The S&I 100 was designed and implemented through a broad, sector-wide collaboration of evaluation firms, ratings firms and other leaders. Financial institutions, funder groups and other leading organizations are helping to share the Index with donors. The Social Impact Exchange will continue to collaborate with leading organizations and experts across the field to expand and improve the Index, and to help make the platform more accessible to donors. The aim is that as donors give to a variety of worthy causes, the S&I 100 will make it easier for them to contribute to nonprofits that they are both passionate about and that have evidence of impact. Major foundations, the Robert Wood Johnson Foundation, the William and Flora Hewlett Foundation, and others are supporting the Social Impact Exchange. The Social Impact Exchange is also working with donor advised funds, such as Schwab Charitable, to offer the S&I 100 to their philanthropic clients. To find out more about the S&I 100, please visit: www.SI100.org. The Social Impact Exchange is a national membership association dedicated to building a capital marketplace that scales high-impact social solutions to improve the lives of millions. The Exchange creates the conditions for breakthroughs to go big in order to deliver impact where it is needed most. Together, Exchange members are making it easier for philanthropic giving to achieve major positive change by supporting strategies that improve lives and change systems. By creating standards to evaluate impact, identifying and tracking highly effective nonprofits, and fostering significant collaborative funding to scale up top social interventions, the Exchange helps foundations, donors, business, and government increase the power of giving to achieve greater social good. To learn more, visit www.socialimpactexchange.org.